Something weird and wonderful is happenning in Tallahassee. 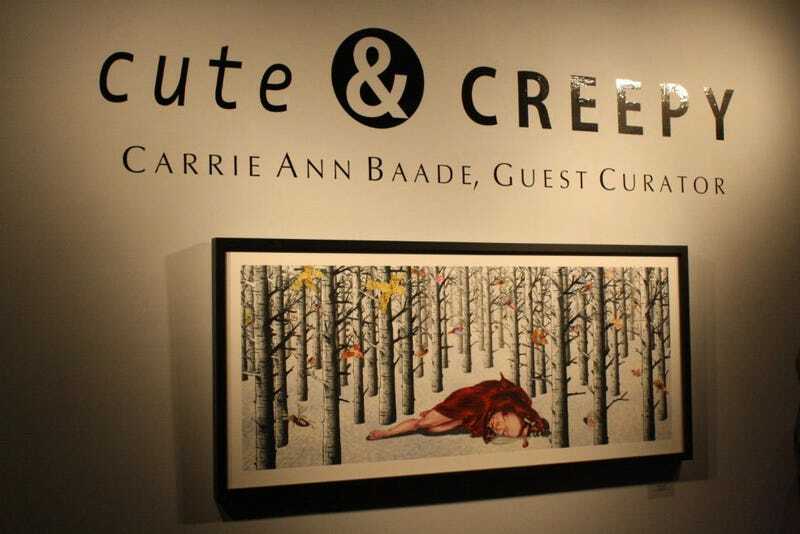 The Cute and Creepy Art Exhibit - guest curated by Carrie Ann Baade. She brings together a collection of Pop Surrealism from 24 of the most imaginative and artistic minds. As you walk into the entrance you are greeted by "Feral Child," a piece from Judith Schaecter, who was present at the opening. Schaecter was visiting from the Rhode Island School of Design. She had given a lecture earlier in the week to FSU art students. Next you are greeted by these seemingly cute and cuddly rabbits from Laurie Hogin, her "Home Fire Series." Another cuddly rabbit (a panel from Laurie Hogin's "Home Fire Series").